The moon has been a focus of human mythology, and a topic of general interest, since the beginning of recorded time. It has captivated observers across all cultures. As viewed from Earth, the pattern of bright highlands and dark maria on the moon’s surface never seems to change. This leads us to wonder: What does the far side of the moon look like? Some speculate that this side beyond our view is a “dark side,” a frozen and desolate surface devoid of sunlight, possibly haunted by malevolent forces. In fact, this myth has permeated popular culture. In the modern era, the dark side of the moon has continuously captured human imagination, sparking a 1990 thriller of the same name and inspiring the title of Pink Floyd’s popular “Dark Side of the Moon” album. However, in understanding the science behind the moon’s orbit, we can prove that there is no dark side after all. One hemisphere of the moon is always lit by the sun as the moon waxes and wanes. Image courtesy of Moon Connection. The proof lies in a couple of factors — the nature of the moon’s orbit and its rotation with respect to the sun’s illumination. No matter where we are on Earth, we see and always have seen only one face of the moon. Since the moon rotates on its axis in the same amount of time that it takes the body to orbit our planet, the same half face of the moon is consistently exposed to viewers on Earth. 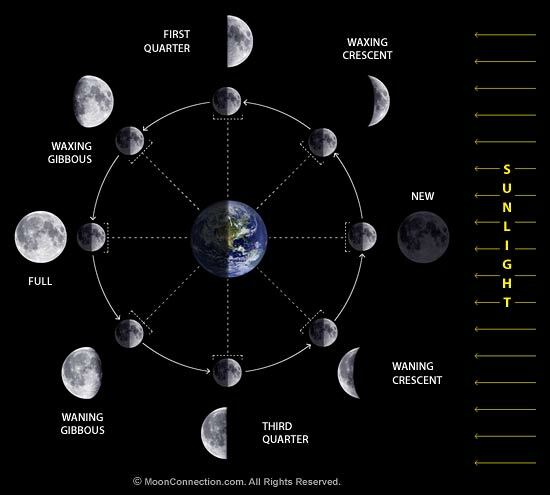 This timing is caused by a phenomenon called tidal locking, which occurs when a larger astronomical body (Earth) exerts a strong gravitational pull on a smaller body (the moon), forcing one side of the smaller body to always face the larger one. Due to tidal locking and other astronomical variables, only 59 percent of the moon’s surface can ever be seen from our planet. The remaining 41 percent, then, remains a mystery, and a subject of creative musings and astronomical research. Moreover, the fact that we earthlings cannot see the far side of the moon does not mean that this face is never exposed to sunlight. In fact, the far side of the moon is no more and no less dark than the hemisphere we do see. Since the moon is a sphere and light shines radially outward from the sun, one hemisphere of the moon is illuminated at all times, except in the case of a lunar eclipse. However, the hemisphere fully lit is only the side of the moon we see from Earth during a full moon. During the moon’s other phases, its apparent shape depends on how much of the sunlit hemisphere we can see from Earth, and how the moon creates its own shadow away from where the sunlight hits. 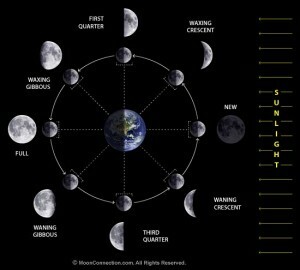 For example, when we see a quarter moon from Earth, we are seeing one quarter of the sunlit surface and three quarters of the moon in shadow. If we could set our sights on the far side of the moon, we would see three quarters illuminated by the sun and one quarter in shadow. Thus, understanding the positioning of the moon, Earth, and sun in conjunction allows us to comprehend that any part of the moon, including the far side, can feel the sun’s rays. Photographic evidence now also confirms that the moon has no dark side. Photographs of the far side of the moon did not exist until 1959, when images were transmitted from the Soviet spacecraft Luna 3. Recently, NASA confirmed the existence of a well-lit far side of the moon by using images from the Wide Angle Camera onboard the Lunar Reconnaissance Orbiter, which fully orbits the moon to construct a full map of its surface. Since we have never seen the far side of the moon from Earth, this 360 degree view may look foreign to us. In fact, we see that the far side of the moon, paradoxically, is lighter in color than the near side since it has fewer dark maria. Still, it is evident that both sides of the moon are not so different from each other and receive about the same amount of sunlight. With an understanding of tidal locking and of the science behind lunar phases, the dark side of the moon is no longer the enigma it once was. Each night we look up at the sky and see the moon in all its glory, we should remember that there is a whole other side to this celestial body that no human has ever seen with the naked eye. Cover Image: The 1973 Pink Floyd album has greatly perpetuated the myth of the dark side of the moon. Image courtesy of All Music.